Bronze body with 316 stainless steel ball contacting PTFE seats and seals. Rugged, Marine construction features stainless steel stem and cast bronze handle. Field reversible handle allows you to select the closed position orientation (clockwise or counterclockwise) that best suits the installation. Tri-Flange base and mount bolt pattern provide easy retrofit when replacing most popular brands. Bottom connections are NPS (straight thread); top connections are NPT (tapered thread); full pipe-size flow. Drain plugs on both sides for convenient winterization. BV Series Valves are serviceable while installed, meeting USCG requirements for inspected vessels. 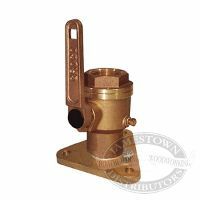 Handle has square hole to accept standard ratchet, to help reach valves in hard-to-reach locations and ease actuation of difficult to operate valves. How tall is the 1.5 inch seacock? overall total height including the handle is 8.0"
Can the top large nut be removed from the seacock while on the boat with the valve in the closed position while boat is in the water? Its leaking when in the open position and appears to be coming from where it joins the lower part of the seacock? I have yet to open and service one of these groco flanged seacocks. However, it is my understanding that is why these are the most expensive out there. The removal and serviceability of the upper portion. I say of u have a leak, go for it. If the leak gets worse u can always tighten it back up. Let me know how it goes. I am changing 1 1/2&quot; through hull which will be used for waste. I will want to use Groco. BV valve but my Question is how do I seal bottom of through hull I have been told that I should not turn the bottom but just pulled in with out turning the seal is this correct? Go to U-tube for video instructions and also check ship shape TVfor how-to's. But if space is limited - your valve needs to be orientated a certain direction and held in place with screws into the hull. Make or buy the proper through-hull fitting tool to tighten the fitting from the outside. Use lots of 5200 on the fitting and then wipe off the excess. I want to replace a thru hull with a thru hull and seacock. Will the GRO-TH500W-1/2 inch NPS (which I assume is 1/2 inch ID) match with the GRO-BV750-3/4 inch seacock? I believe all measurments are in ID. With a little poking around I did find a IBV in the 1/2in size. My guess is that the flanged IBV start at 3/4 inch. If I were you and wanted the confidence and strength of the flanged IBV I would buy the 3/4in thru-hull and expand the size of the hole in your hull. Easy to do by hammering a wood plug in from the outside of the hull and using a multi tool to cut it flush. That way you can get a pilot bit to drive the hole saw through accurately. We have a 3/4in thru hull for the water inlet of the head. I have seen 3/4 used for raw water intakes for the engine as well. Let me know what you end up doing. Cheers! well made and obviously heavy duty. I needed to change which way the valve turned based on the mounting location in my boat and it was as easy as removing the stop nut and remounting it on the other side---there was no need to remove the handle or move any other part. I am confident that this bronze valve will hold up to the salt water that will no doubtedly be in my bilge! This seacock is well made and well engineered. Gives one a sense of confidence.